Labour Party leader Ed Miliband risks exposure “to a daily dose of political blackmail” at the hands of the Scottish National Party (SNP) if he forms a coalition with it, ex-Conservative Prime Minister John Major has said. In his first noteworthy intervention in Britain’s general election race, Major offered unwavering support for Prime Minister David Cameron’s repeated warnings regarding the “frightening” possibility of a Labour-SNP deal in the event of a hung parliament. Major, who campaigned against Labour’s proposals for a Scottish parliament in the 1997 general election, told crowds gathered in the West Midlands on Tuesday that Britain needs a secure and strong government. “At the very moment our country needs a strong and stable government, we risk a weak and unstable one – pushed to the left by its allies, and open to a daily dose of political blackmail,” he said. READ MORE: Devolution: Whose victory march? As the general election race rolls onward, SNP leader Nicola Sturgeon’s proposals of ending austerity and devolving full control over Scotland’s finances to the Scottish government continue to arouse alarm in Westminster circles. Conservative critics warn the SNP wishes to split the UK, severing Britain’s 300-year-old union. They stress a Labour-SNP coalition would spell disaster for Britain. Reminiscent of the ‘No’ campaign’s ‘project fear’ in the run up to last year’s Scottish independence referendum, sections of the British press have sought to portray the SNP as a dangerous, self-interested, anti-business party. And like the British establishment’s representation of Scottish independence as a recipe for economic peril, dwindling national security, an EU membership in jeopardy, and ruptured NATO relations, growing establishment rhetoric against Sturgeon’s party is apparent. In a bid to challenge this rhetoric, some critics have warned it is both counterproductive and short-sighted. Leading Conservatives’ use of the SNP as a vehicle to smear Labour is a myopic and dangerous game, Lord Forsyth of Drumlean told the Guardian on Tuesday. Showing profound unease with the Tory tactics, Forsyth accused PM David Cameron of shattering Scotland’s pro-UK alliance and inciting English nationalism. The Conservative peer went on to argue this destructive and “short-term” strategy threatens the future of Britain itself. Echoing Forsyth’s concern, ex-Liberal Democrat party leader Lord Steel said the Conservatives’ strategy will prove fruitful for the SNP. “Labour would be in hock to a party that – slowly but surely – will push them ever further to the left. And who would pay the price for this? We all would,” he said. 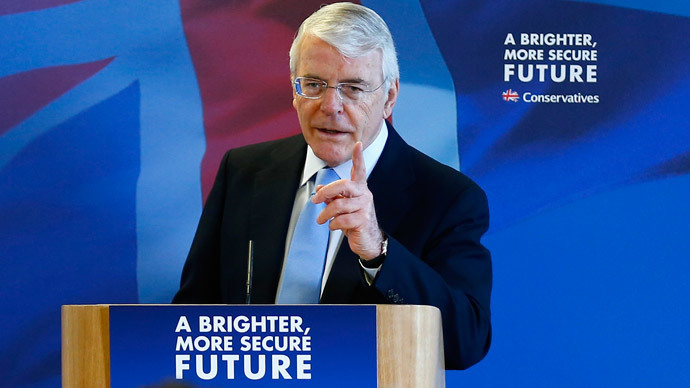 Major’s interventions are rare, largely because he wishes to avoid repeating ex-Tory Prime Minister Margaret Thatcher’s tactics, whereby she operated as a backseat driver after stepping down. Despite recent criticism, the Conservative Party believes its warnings of a Labour-SNP deal will prove beneficial because it clearly illustrates one of the Tories key campaign messages – that a government devoid of the Conservatives is a recipe for chaos. Miliband has previously ruled out a Labour coalition with the SNP. But he has also failed to rule out an informal deal for fear of appearing to leave Scottish voters disenfranchized.